Incorporate local foods into your delectable creation. 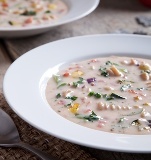 A lusciously satiating creamy tomato soup brimming with fresh, seasonal farmers market vegetables, healthy grains, white beans and herbs. Add tomatoes and whisk to combine. Set aside. In a separate large non-stick sauté pan or large saucepot, heat oil over medium-high heat. Add peppers, squash, zucchini, onion and kale. Sauté just until tender; approx. 12-15 minutes. Add to the tomato-creamy soup base and stir to combine. Add the beans, wheatberries and Italian seasoning to the soup, stir to combine. Season with salt, to taste. For each order, ladle 8 oz of hot soup into soup bowl.